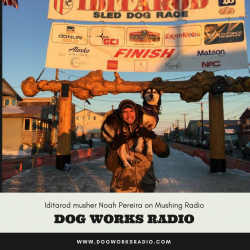 Join host Robert Forto as he welcomes Noah Pereira to Mushing Radio. Noah completed his first Iditarod in March of 2016. Noah Pereira, 21, was born and raised in Brockport, New York. Growing up, he met local mushers and was amazed after talking to them. He began mushing in 2009. He and his dad came to Alaska in winters of ’13, ’14 and 15 to train dogs. In 2013 he became the first non-Alaskan musher to win the Jr. Iditarod. He says he moved to Alaska to continue training dogs and currently owns 21 dogs. “My team consists of young dogs hoping to make it to Nome for their first time.” When not mushing, he enjoys hunting and fishing.